Marine Corps Base Hawaii -- Sports offer more than competition. Multiple activities can provide a chance for healing, especially for Marines with Wounded Warrior Battalion West-Detachment Hawaii. Several Marines with Wounded Warriors participate in the Marine Corps Trials, an eight-sport competition specifically created for wounded, ill and injured Marines. The sports offered are archery, shooting, cycling, track, field, swimming, sit down volleyball and wheelchair basketball. The annual competition is in its fourth year. During archery practice, Capt. Chris McGleinnaiss discussed the positive impact the Marine Corps Trials have had on his life and his healing process. "I have been struggling with Meniere's disease and traumatic brain injury since June 2011," said McGleinnaiss, a native of Orinda, Calif. "Meniere's disease is an inner ear disorder that effects my balance and hearing. This compiled with multiple concussions results in many side effects, like vertigo and trouble reading and focusing." McGleinnaiss moved to the detachment in June 2012 from the base's Legal Services Center as a senior defense counsel. 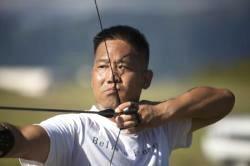 He began archery a month later, having never picked up a bow before. "Archery was my first choice because I'm limited to stationary sports due to my illness," McGleinnaiss said. "I participated in this year's trials and I think it's one of the best opportunities we have for wounded warriors. 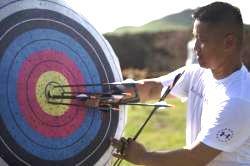 Archery develops mental discipline, which can help calm the body. I've learned to refine my coping skills. The therapeutic benefit to shooting is it helps clear my mind and gives me something positive to latch onto everyday." Rachel Barbieto, the program manager of the Wounded Warrior Athlete Reconditioning Program, said about five athletes participate in archery at the trials from the Hawaii detachment. "They train about four times a week for between one to three hours," said Barbieto, a native of Rockingham, N.C. "Competing in the Marine Corps Trials is challenging, mentally and physically. The 10 days of the trials are intense. Each Marine must participate in two sports, but some of them choose to do three or more. The 12-hour days are demanding, but the Marines prevail." Barbieto said at the 2013 trials one Marine from the Hawaii detachment, former Sgt. Clayton McDaniel, won the gold medal and went on to compete at the Warrior Games in May. She said there were more than 100 competitors this year at the Marine Corps Trials. "The top 50 at the trials are chosen by the coaching staff to be on the all Marine team that competes against the Army, Navy, Air Force, special forces and allies at the Warrior Games," Barbieto said. "The Warrior Games are held at the United States Olympic Training Center and it's quite an honor to be chosen." McGleinnaiss said the Hawaii Marine athletes are a force not to be overlooked. "We train with less equipment than the other wounded warrior detachments receive," McGleinnaiss said. "So our achievements are a good testament to our spirit." The Marine Corps Trials will be held in March at Marine Corps Base Camp Pendleton, Calif. McGleinnaiss is practicing and hopes to participate. With the snap of a bowstring, McGleinnaiss discussed the drive that helps him to heal. "I've been told to never feel comfortable in life so that you progress and constantly push," McGleinnaiss said. "It's hard to live by this when you feel like your whole world has fallen apart. But through therapy, you can turn 'I can't' into 'what can I do?'"